I learned crochet the old way: the doily way that is. 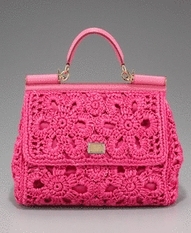 It really never occurred to me back then that anything besides doilies and table clothes could be made out of crochet. Crochet and knitting have both greatly evolved since my days. It is present everywhere: on the street as yarn bombs*, on the runaway and as pass time for common mortals like myself. It is not only a Fall and Winter thing but also Summer and Spring. 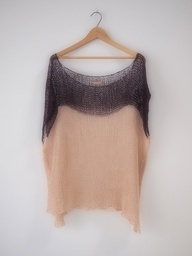 Knit and crochet pieces are wearable any seasons. 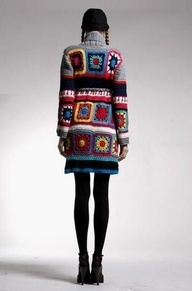 Who knew granny squares could be so in vogue and all the crazy designs that can be made! Finishing a handmade piece bring a sense of accomplishment and power. To be able to create something out of a single thread has always been one of the greatest thing in life for me. It is a joyful and sometimes frustrating process but teaches patience and courage. So go ahead I encourage you to take that knitting/crochet class you’ve always wanted to take or pick up your lonely needles. 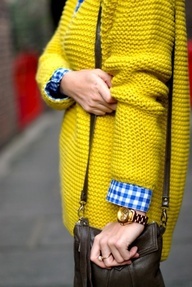 Don’t worry, if you already knew how to knit/crochet it will come back or take a refresher class from a yarn store. The possiblities in knitting and crochet are endless. You are missing on a great thing. 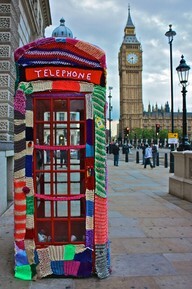 *Yarn Bombing can be considered as a non permanent form of grafitti that use knitting or crochet. 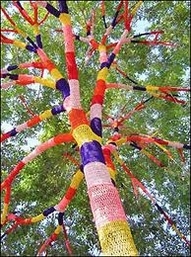 The first yarn bomb may have been reccorded around 2004 in the Netherlands. Great blog and keep up the good work. Merci ma cherie! I created a little piece thinking of you and your wonderful style. 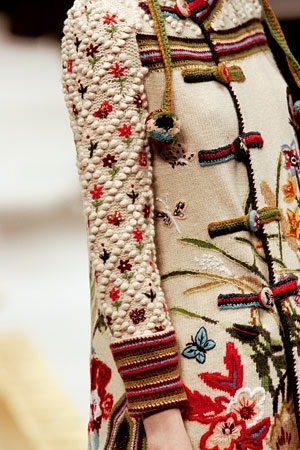 crochet is back on the hook! I remember our sessions every thursday with that old lady (forgot her name) God bless her sould. Crochet was fun and you were always so good at it. Your rows were always thight and perfect. Never that sloppy loop that some girls alway made. Absolutely love your blog blog. Keep up with the passion! I’m expecting a store soon with maybe items for sale! lol!